As I head out to August Town Primary School, I am reminded of how it all started. It was the Decision Sciences Institute meeting in Phoenix, Arizona in November of 2007. I was stepping out of one of those afternoon sessions, looking for coffee, when I ran into my good friend and colleague Prof. Evan Duggan. I had recently acquired a little green laptop via the OLPC developer program (thank you, Jim!) and was excited about the program. Evan and I talked that afternoon about the laptop, its capabilities, but more broadly its possible implications of access to information in schools. Challenging children at younger ages, and keeping them interested in learning - the real kind, not rote memorization. In that conversation, Evan mentioned UWI, August Town, and invited me to spend my sabbatical leave at UWI. The next thing I knew, I was putting plans together, writing to people and strategizing on how such a project could be done. It was an ambitious attempt, and had a certain Quixotic foolishness written all over it. However, sometimes it takes such foolishness to think outside the metaphorical box. I was at UWI in 2008 and we set our plans in motion. This was also the time for the creation of the Center of Excellence, which now plays a central role in our efforts, many thanks to its Director Dr. Maurice McNaughton and the staff at CoE. 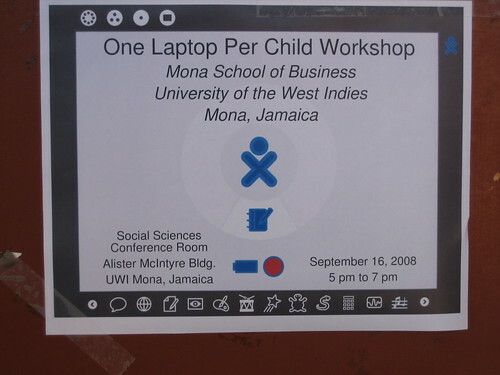 We had several meetings, and started the OLPC Jamaica volunteer community. We were also able to get a small cache of laptops from the OLPC Contributor Program to seed initial activities of the newly-formed community. We were invited by ICT4D Jamaica to introduce the project. That was a very successful event. People crowded around our table. 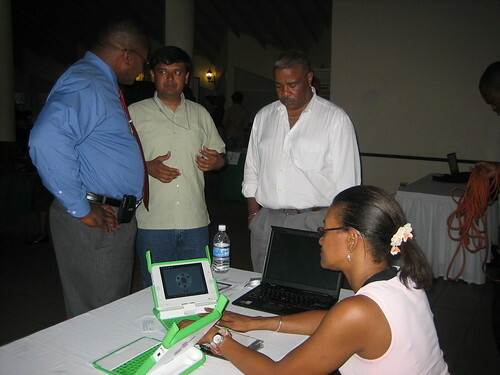 In fact, the good folks at ICT4D Jamaica asked us to put away our XOs so that they could get started! After several attempts at funding and partnerships, combined with the economic downturn, it looked like this project wasn't going to take off the ground. Then something interesting happened, and we were connected with the good people at P.A.C.E. Canada. After working out the partnership, we we back on the project with funding for two school deployments. It took three years to get to this point, but it was well worth it, and in no way is this the end. Rather its in the early stages and much remains to be done in keeping the effort sustained for August Town School and Providence Basic School, and many other communities beyond.